have found that this gland is distinctive because its membranous lining, which is folded into a number of sacculations or pouches, opens into the stomach cavity by way of 25 or 30 large crater-like holes. As the cells and tissues of this gland do not appear to be different from those in the rest of the stomach mucosa the functional significance of the cardio-gastric gland is not yet understood. In their studies on the digestive tract and digestion in wombats, Barboza and Hume found that lipids, proteins and soluble carbohydrates in the plant cell contents were digested and absorbed in the stomach and small intestine. The food passes from the stomach into the small intestine, which in an adult wombat is about three metres long. At the end of the ileum (that part of the small intestine nearest the large intestine or colon) is a very small narrow projection which forms the caecum. Barboza and Hume found that there were several permanent sacculations, near the junction of the ileum with the caecum. The most important feature of the wombat's digestive tract is the colon, which is about four metres long. 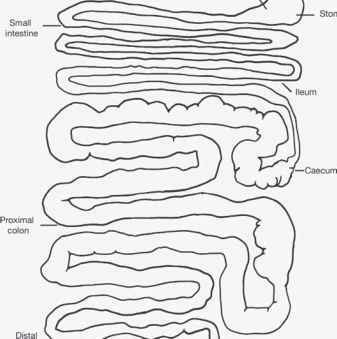 Barboza and Hume found that the lining of the first part of the large intestine (the proximal colon, which is about three metres long) was extensively folded, with two large permanent sacculations in an area about two-thirds of the way along its length. The proximal colon and the distal colon have a very large capacity - Peter Gowland found it to be about 68% of the total capacity of the stomach and intestines. The colon contains a dense population of bacteria. All parts of the gut also contain very large numbers of bacteria, but the numbers are three to eight times higher in the colon than in the stomach and small intestine. Experiments by several researchers indicate that these bacteria act on the food as it passes through the gut, breaking down the fibre by microbial fermentation. Perry Barboza and co-workers found that particles of food took an average of 49 hours to pass through the wombat's gut, due mostly to a very slow passage through the colon, and their experiments indicate that the colon is a site of microbial fermentation and fibre digestion. The wombat is therefore classed as a hind-gut fermenter. 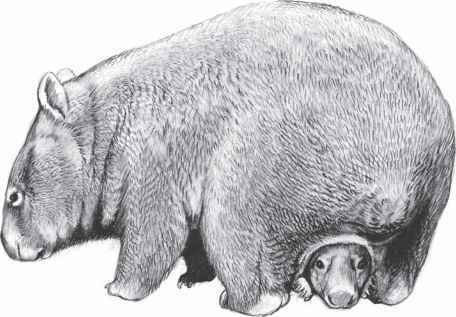 The possums and the koala are also in this category, whereas the other members of the Diprotodonta, the kangaroos, are fore-stomach fermenters. Are carbs important to a wombat?